Moving Pictures is an animated tribute to 2017's best picture nominees. During the year, we were very moved by several films, and wanted to pay tribute to their brilliance. Throughout 3 or 4 weeks, we watched the nominated movies we had missed, sketched out a storyboard, developed styleframes, and improvised our way through a whole minute of animation -- as neither of us is an animator by trade. It was a fun, challenging endeavor -- and ultimately one that proved itself immensely rewarding. If you ask us, we would smile through it and say we'd do it again. Infinite thanks to Thiago Gautério (fita.nu) for the wonderful work on the music and sound design. Thanks for watching! We hope you like it. Below are a few styleframes from the video, in full resolution. A lot of people found it fun to try to guess which shots relate to which movies; if you want to be spoiled, select the greyed out text beneath the images. Here are some of the isolated character designs. And here are a few breakdowns of how the shots were assembled. Almost every shot was built with parallax in After Effects. This helped create some visual interest and balance out the minimalist animation. To help with alignment and enhance the efficacy of the match-cuts, we used a grid to inform most of our composition choices. The use of the circle motif helped in several transitions, as it brings the focus back to the center of the frame. One of our major challenges was trying to keep colors from clashing from one shot to the other. Normally, an animation like this would follow a color script. This video, however, cuts away from different films in quick succession, so maintaining consistency was always a concern for us. To that end, we sought to keep every shot color palette contained to just a few colors and an accent hue; it was usually that accent that served as a visual glue to the next shot. A few examples are the bright moon and the lens flare in the subsequent shot, or Emma's bright red hair in the two La La Land scenes. 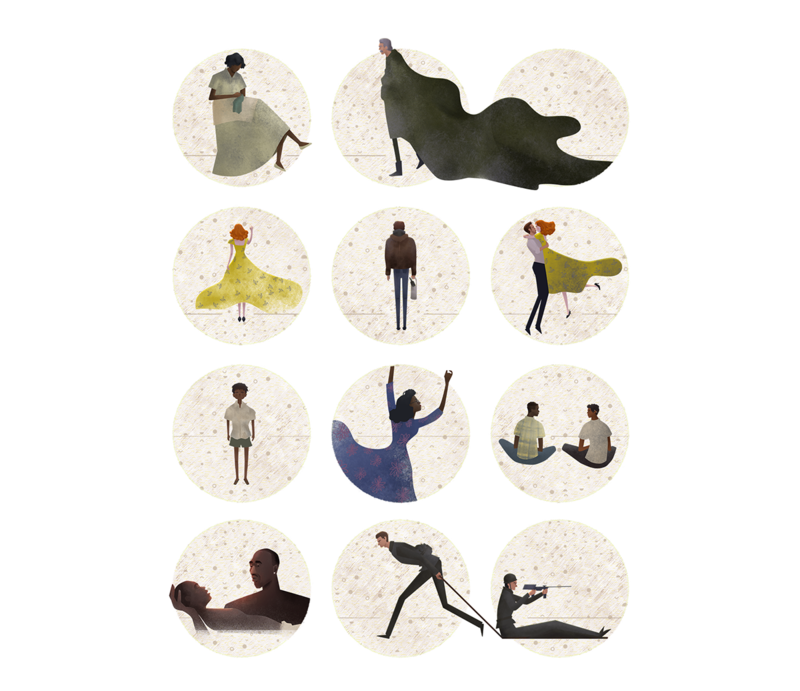 About Moving Pictures Moving Pictures is an animated tribute to 2017's best picture nominees. During the year, we were very moved by several films, and wanted to pay tribute to their brilliance. Throughout 3 or 4 weeks, we watched the nominated movies we had missed, sketched out a storyboard, developed styleframes, and improvised our way through a whole minute of animation -- as neither of us is an animator by trade. It was a fun, challenging endeavor -- and ultimately one that proved itself immensely rewarding. If you ask us, we would smile through it and say we'd do it again. 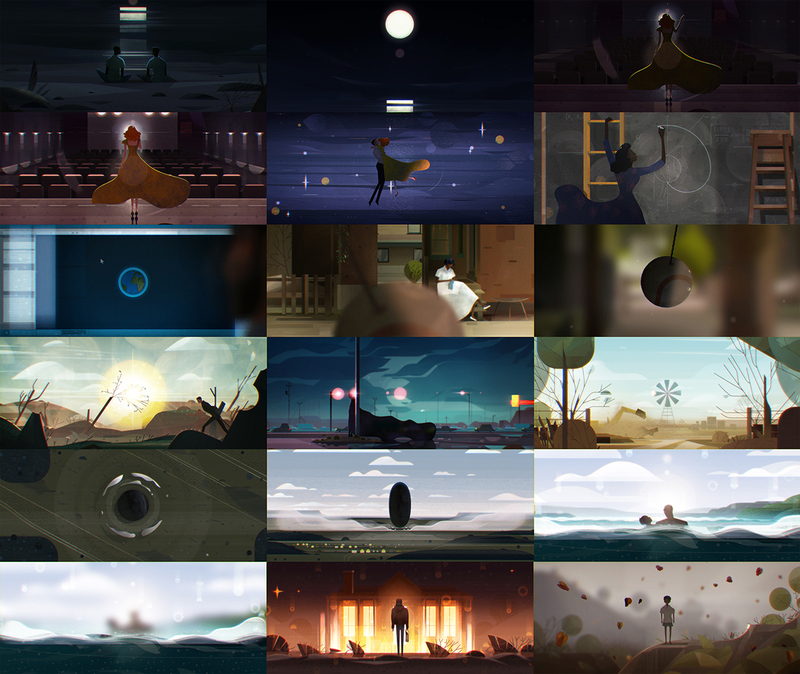 Infinite thanks to Thiago Gautério (fita.nu) for the wonderful work on the music and sound design. Thanks for watching! We hope you like it.